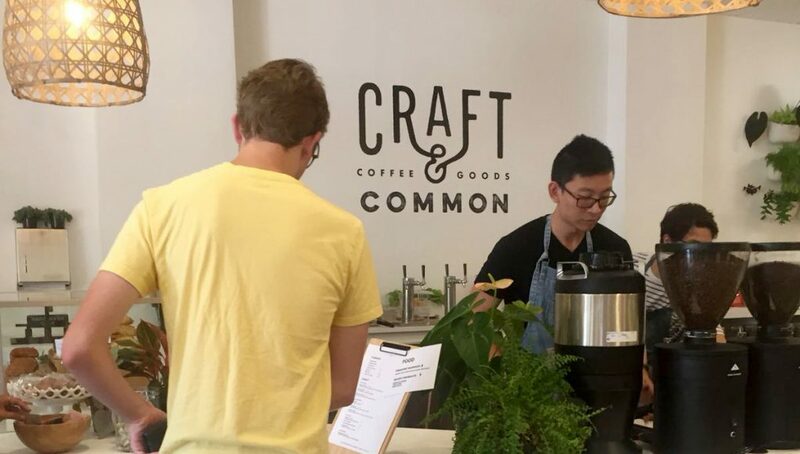 As the coffee culture in Orlando grows, coffee shops focus on producing quality products in the best environment possible. Though Downtown Orlando follows the “Starbucks on every corner” urban policy, the competition between uprising cafe’s proves that it’s not enough to serve a single bland blend that matches everyone else’s. For each new shop that opens up, the bar raises one notch higher. 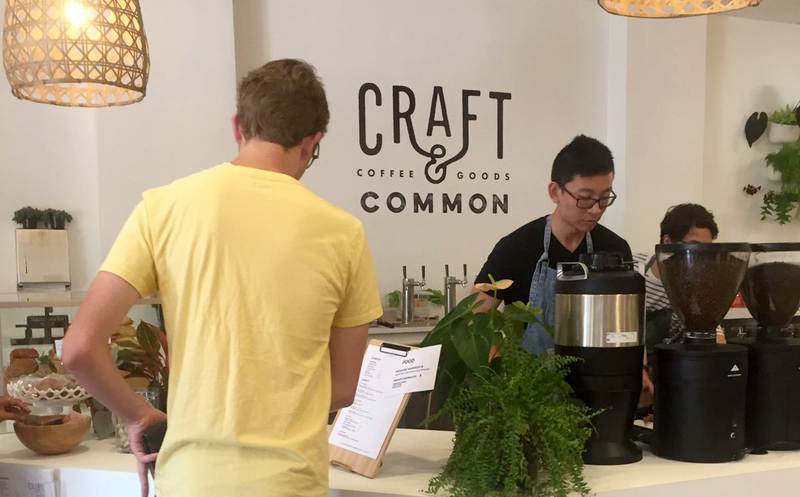 After less than three months of business, Craft+Common, a cafe which fuses retail and coffee, surpasses the expectations set by its predecessors. When taking into account all that goes into a coffee shop experience, preference cannot equate to quality. With so many options, an excellent coffee experience must include personality, a tasteful product and efficient delivery. Craft+Common ticks off every box. The shop clearly labels itself to passersby with a black “COFFEE” lettercut against a white backdrop adjacent to the windows, reflecting the minimalist style within. However, that’s not to say that the elements within the shop don’t stand out. On one side, a row of goods are displayed on white shelves. Next to which tropical wallpaper is lit by a neon pink sign reading “it was all a dream.” The brightness of the two areas draws customers to the retail side, and encourages them to interact and document their experience. Throughout the shop, rows of greenery adjourn the white walls and serve to tie everything together, allowing the shop to showcase products and photo-op areas without overwhelming the senses. In terms of product, everyone orders a different cup of coffee. Whilst some prefer the bitterness of Americanos, others gravitate towards the creamy, sugary Affogato (or the thousands of combinations in between.) In the case of Craft+Common, the drinks range more on the creative side. Keeping in theme with the visual lush, nature-based branding, the menu includes a multitude of plant-based ingredients, such as matcha, flowers, cardamom, lavender, and various fruits. But, they do include classics for those that aren’t as willing to go out of their comfort zones. Unlike the Boone-adjacent Drunken Monkey, all drinks served come with a branded aesthetic. Dining in, the drinks are showcased in a clear glass at their prime, perfect for posting to various social media, and allowing the shop to get more recognition online. 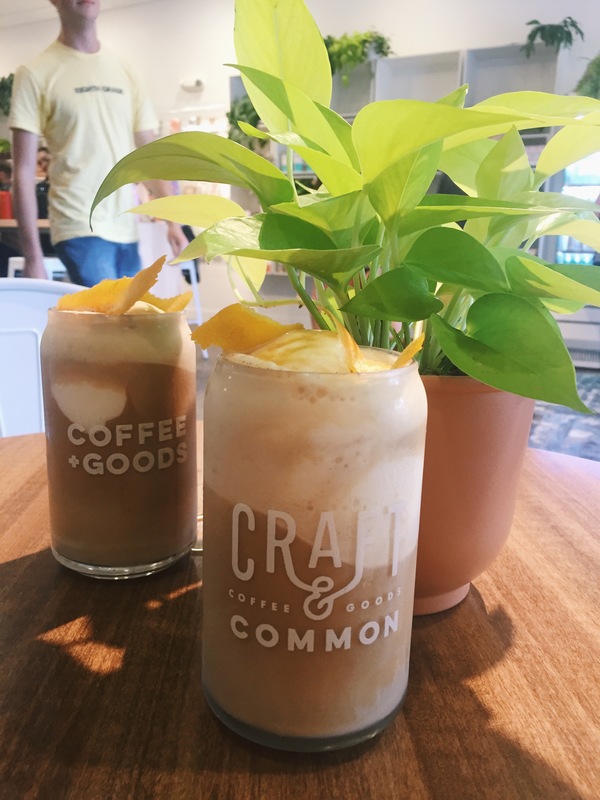 Whether stopping in for a post-church brunch or just looking for a quick cup before a meeting, Craft+Common has it all.